We also help local watershed and conservation groups with fish passage, habitat improvement and water conservation efforts in the Deschutes River Basin through the Pelton Round Butte Fund. We are passionate about our work and excited to share more. Below is a highlight of a few habitat restoration projects. You can also find more information on our Fact Sheets & Studies page. Background: Some of the most heavily used spawning gravel bars for wild native Chinook salmon, steelhead and redband trout are found downstream of the Reregulating Dam. When the dams were constructed more than 50 years ago, it was thought that gravel and sediment from upstream settled into the reservoirs rather than being naturally deposited in gravel bars. Our Work: We launched a Gravel Study, conducting extensive field monitoring from 2007 to 2014 to determine how gravel and sediment were being transported and identify any changes in the quantity and quality of spawning gravel used by salmon and steelhead. Results: Compared to other rivers, the Deschutes has an extremely stable year round flow pattern. We found that most gravel transport occurs in local, limited areas and the overall rate of gravel loss is very low. The quality of spawning gravel was found to be excellent for survival of developing trout embryos. A team of experts reviewed Gravel Study results and made recommendations for experimental gravel placements downstream along with a second phase of monitoring. Pelton Round Butte’s Fish Committee approved the Phase II Gravel Study in 2016. Download the Gravel Study Fact Sheet for more details. Background: The Lower Deschutes River flows for 100 miles in a deep desert canyon with white alder trees along the banks and cottonwood trees on islands. Large wood provides cover and shelter for both fish and other wildlife in the channels. When the dams were constructed more than 50 years ago, large wood from tributaries entered Lake Billy Chinook, as opposed to being naturally transported downstream to the Lower Deschutes River. Our Work: Large wood found in Lake Billy Chinook is removed and transferred downstream annually. Each piece is tagged and tracked using GPS to monitor the movements of large wood after placement. We conduct surveys in the spring to monitor how fish and wildlife are using large wood. Results: We’ve moved a total of 329 pieces to the Lower Deschutes, relocating large wood as far as 25 miles downstream from original placement. We hope to enhance ecological function as wood abundance increases along the Lower Deschutes. Download the Large Wood Fact Sheet for more details. Background: One of the few remaining populations of wild native summer steelhead is found in the Trout Creek Basin. For more than a century, steelhead habitat has been impacted by land use activities. We purchased Trout Creek Ranch in 1999, where more than three miles of Trout Creek flow on the ranch. Our Work: As part of the Trout Creek Habitat Enhancement Project, we initiated a channel restoration project on Trout Creek to support the production of summer steelhead. More than 25,000 native trees shrubs and grasses were also planted along the new channel and floodplains were seeded with native grasses and forbs. Results: Summer steelhead began spawning in the project area the year following construction. There have been several high flows, which spill out onto the floodplain and deposit sediment. Summer flows are still very low and the water is warm, so juvenile steelhead migrate downstream after hatching to rear in the Deschutes river for one to two years before migrating to sea. See the Trout Creek Habitat Enhancement Project Fact Sheet for more details. Background: A robust population of bald eagles, golden eagles, ospreys, and Prairie falcons are supported in the vicinity around the Pelton Round Butte Hydroelectric Project. For nearly 25 years, raptors’ annual productivity has been monitored closely by agencies and restoration groups. Our Work: PGE has also conducted a number of studies on raptors to help protect, maintain, monitor, and manage raptor populations and habitat in the area. We are currently in the fourth year of studying Golden Eagles where our biologists track the birds’ movements to better understand the local population. Results: We’ve increased our knowledge and shared our research on the local golden eagle population as well as individual bird movements. In addition, we are proud to sponsor Eagle Watch, an annual event held in February, which draws hundreds of visitors to Round Butte Overlook Park. Background: The Winter Range provides critical winter habitat for mule deer and other wildlife. Native vegetation includes mixed conifer, western juniper, mixed shrubland, rabbitbrush, bitterbrush, sagebrush, and native grasses. Wildlife includes bats, mule deer, elk, cougar, bald and golden eagles, mountain and California quail; many native bird species including western meadowlark, mountain bluebird, several sparrows, American robin and northern flicker and a variety of native reptiles and amphibians. Our Work: We coordinate with the Bureau of Land Management, the United States Forest Service, and Oregon Department of Fish and Wildlife to manage the land. By aligning our work, we maximize efforts and create larger blocks of wildlife habitat. Results: Together, we are protecting, monitoring and maintaining critical habitat for wildlife while providing recreational activities including hunting, hiking, bird watching, and mountain biking. 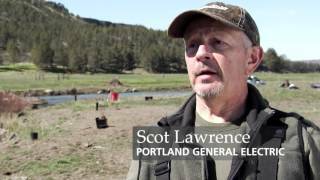 Watch this video to learn about collaborative projects aimed at restoring and improving habitat, water quality and fish passage for salmon and steelhead on an iconic Oregon river. Healthy salmon and steelhead need healthy habitat to rear and spawn, so PGE teams with community organizations on projects across the Deschutes Basin.